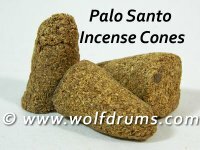 Natural palo santo incense cones. Each cone measures approx 4cm in height and 2 - 2.5cm diametre at the base. Uses: purification ceremony/ clear negative energies, spiritual protection, attract good luck.